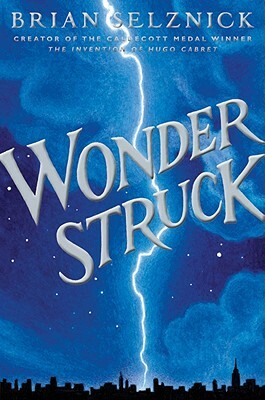 Wonderstruck by Brian Selznick. Grades 3-7. Scholastic, September 2011. 637 pages. Reviewed from ARC provided by publisher. In 1977 in Gunflint, Minnesota, twelve-year-old Ben is missing his mom who died in a car accident. Going through some of her stuff, he finds a strange book about museums which starts him on a quest to New York City to track down the father he never knew. The freak accident that left him completely deaf won't stop him. Will it? In 1927 in Hoboken, New Jersey, twelve-year-old Rose watches the world from her window. She longs to explore the streets of New York, just across the water, but her parents don't think it's safe for a deaf girl to be out exploring. Rose decides to take matters into her own hands and runs away from her house. These two stories, one in prose and one in Brian Selznick's inimitable images, are tightly intertwined and will keep readers on the edge of their seats. You guys. I loved The Invention of Hugo Cabret and the kids at my library are CRAZY for it. And I am telling you that I loved Wonderstruck even more. Hugo was innovative. And here, Brian Selznick takes that same format and creates an even more compelling story. The intertwined stories are tight and switch quickly back and forth. Since Ben grew up with partial hearing, it made sense to me that Ben's story was in prose, while Rose, who has been deaf from a very young age, her story is told in images. This story's of particular interest to me since I studied sign language in college and have some knowledge of Deaf culture, but it will DEFINITELY appeal to a large audience. It's such a wonderful format, too. Kids love that feeling of finishing a really THICK book and combining text with images in this way makes the book accessible to kids who might never attempt a full-prose book of that size. Wonderstruck will be on shelves September 13 and YOU DO NOT WANT TO MISS THIS BOOK.